Food as a Lifestyle is the first reality show of its kind, giving viewers a behind-the-scenes look at what it means to be a chef. We’re attempting something that’s never been done before, creating a real reality show as it affects the life of a restaurant chef, industry operator, and how this actually affects the consumers. Foodable WebTV Network is excited to announce a new partnership with Miami celebrity chef Adrianne Calvo, who will be the first featured chef in the Network’s new chef reality show, Food as a Lifestyle. Filming for the show began in October. 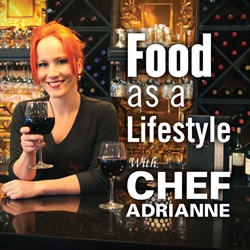 The show will shadow Chef Adrianne, Owner of Chef Adrianne’s Vineyard Restaurant and Wine Bar, to give viewers real insight into the life of a chef and what it takes to make food your life. Food as a Lifestyle is the Network’s first franchise-model show, and will eventually feature different chefs in each major food city. The first episode is focused on showcasing the passion and teamwork it takes to make it in the restaurant business. You can check out episode one here, be on the lookout for more episodes coming soon on FoodableTV.com. “We’re attempting something that’s never been done before, creating a real reality show as it affects the life of a restaurant chef, industry operator, and how this actually affects the consumers they serve,” says Paul Barron, Foodable Founder and Executive Producer. Aside from being a restaurateur, Chef Adrianne has two cookbooks under her belt, a recurring television segment on NBC Miami, and has even started her own foundation, “Make It Count,” in support of St. Jude’s Children’s Research Hospital. Chef Adrianne is known for bringing “dark dining” to the local scene, and has made several TV appearances in both the local community and nationwide. Foodable Founder and Executive Producer Paul Barron merges his background in social, publishing and producing to bring this new concept to life. He began building Foodable WebTV Network over three years ago as the first media platform that merges content for both the pro foodie crowd, as well as industry leaders, restaurateurs and chefs. Founded by DigitalCoCo and led by Paul Barron, the Foodable WebTV Network is a content platform for the restaurant & hospitality industry, covering both trade and prosumer content. With six city blogs, a national blog, ten WebTV shows - both on-location and in-studio - and a social media audience of over 400,000, Foodable Network is set to be the go-to content provider for restaurant & hospitality professionals. Foodable currently is on track to hit more than 250 million impressions in the first year of the network. Learn more at http://www.foodabletv.com.